If you’re looking for an efficient and affordable way to improve the interior décor of your home, tile flooring is the way to go. You can add a new design element to your home that perfectly matches your sense of style. From sleek and modern to richly textured and classic, we offer a wide selection of floor tiles that won't disappoint. With design options from high-quality brands, you can choose from a broad selection that’s sure to offer the design solution you need. You can upgrade your home by installing high-quality ceramic tile. Tile is one of those versatile materials that can look stunning in any space, including a living room, dining room, or recreation area. Choose from our attractive ceramic floor tiles that come in many different styles. We guarantee you can find a great option to suit your needs in looks, performance, and price. Ceramic tiles are formed from clay mixed with minerals (which accounts for the color variation), and water. After firing and glazing, they’re remarkably scratch-resistant. This makes ceramic tile flooring great for high-traffic areas. The colors can range from muted neutrals to bolder ones. They make an ideal complement to almost any design scheme. 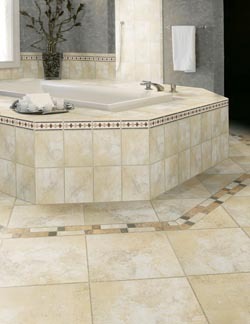 Our locally owned store offers all types of ceramic tile floors. Tile is a great flooring choice because if offers a strong, moisture-resistant surface that’s capable of withstanding high-volume foot traffic. We stand behind all of our merchandise by providing some of the best guarantees in the industry. As your go-to shop for flooring products, we make sure our items are priced at the most competitive rate. You can count on our free pre-measuring to ensure that you purchase the correct materials and supplies for your project. This prevents you from paying for extra materials or supplies you simply don’t need. Giving your living room or kitchen a beautiful new look is easy when you choose from our many different ceramic floor tiles. Our flooring specialists are happy to guide you every step of the way—from selection to installation. With our wide assortment of colorful choices, you can breathe new life into any indoor or outdoor area. For instance, you can bring the look of nature inside by adding tiles that feature earth tones to your floors. If you want to brighten or give a feeling of openness to a small room, we have white and light neutral colors for you to use. Maintaining the look of a tile floor made of ceramic is easy, and takes very little time. With just a few simple cleaning solutions, you can keep your surfaces in tip-top condition. Clear away dirt and dust using any household broom or vacuum cleaner. To get rid of bigger messes, use a mixture of mild detergent or soap and water. Liquid spills can also be wiped up easily, as tile is non-porous and water-resistant. Just use a cloth or mop to wipe spills away. At our ceramic tile shop, you’ll have all the help and support you need to plan your project from start to finish. Besides floors, some of our ceramic tile products can be used for wall projects such as adding ceramic tile wall or a ceramic backsplash to a kitchen or bathroom space. Two of these options include the Fidenza and Parkway wall tiles. They make outstanding kitchen counter backsplashes or eye-catching shower walls. Our design associates are happy to work with you to figure out the best applications for the tile you choose during your home improvement project. Ceramic tile installation is not a job for amateurs or the inexperienced contractor. Ceramic tile floor designs can be as intricate as you wish; however, proper execution of your vision requires expertise and training. The process can offer unique creative freedom. You don’t have to be limited to the basic grid-work of tiling. Patterns such as brick floor-tiling are extremely popular, and create an urban subway-style look. One of the current popular tile flooring patterns today is a bold checkerboard pattern. The look is timeless, but also adds retro flair to a space. Creating such detail as a tile border is fairly simple, but adds an elegant touch to your finished results. Our commitment to being on your team doesn't end after you have picked out your tile. The professional-quality flooring installation that we offer is part of our comprehensive list of flooring services. We are ready to help you take your vision from a concept or a simple desire to renovate to the kind of finished results that you can be proud of for years to come. Don’t leave your job in the hands of amateurs or an inexperienced contractor when our specialists are ready to provide the results you deserve for a price you can afford. Contact us today. We proudly serve the communities of New Haven, East Haven, Branford, North Haven, and Hamden, Connecticut.